I'm sorry if this has been covered before. I tried to find answer in the search but got somewhat lost in the wave of posts! I picked up my first MG a couple of days ago beilived to be a eary Yugo '53 one. When I got around to stripping and cleaning it though I found a number of marks which I dont think are Yugo. Is it possible than my '53 started out as a '42? This is more for interest rather than anything else as it makes little difference to me. The markings I've found so far are, WaA610, BK, 2 on the reciever, WaA COF on the belt pawls, dfb, WaA25, 44, BK on the biepod. Aswell as the normal series numbers. BK seems to be stamped on most thing as well. Thanks for the welcome Bil. I had a look in the stickies to try and figure a few things out but the differences seem to be so small in some cases its hard (for me anyway) to tell the differances between them! I'll continue reading and see what I can learn. post some pics of of your gun and we can let you know what you have. If you need to compare I have an MG42 and an M53 so I can do a side by side comparison. 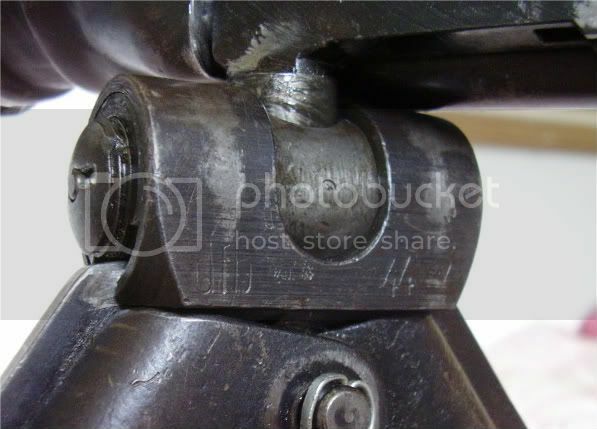 I looked at one of your old post just last night about the differances between the two showing the taper finishing by either the first hole (MG42) and second (ish) hole on the MG53. My taper look like it is the latter and so is an MG53, with a german receiver. It has Yugo markings above the German WaA marks though stating 7.9mm M53, K88927, 44. It also has a Yugo trigger having "V" and "0" on the switch. I also founds the marks 22, 13A, 9233C, W (in a square box) and W (in a triangle) on the barrel. So I figuer it's a MG53 with a small number of German MG42 parts. I'll try and take some pictures this evening. A pic taken this morning. Not a very good picture but you can just see the WaA to the right of the dfb. 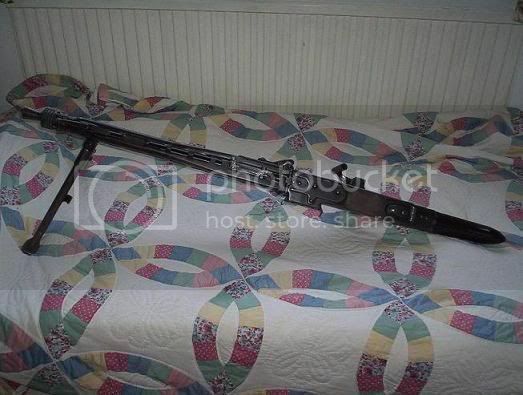 I think mine needs alittle TLC before it gets anywhere near the condition of some of the guns on this site! cof and dfb markings are found on German guns. I see the "cof" mark on most of the parts marked with the "squatting chicken" stamp. I also see a lot of Yugo marked guns with German marked internals. I would guess the Yugo's got a hold of some original 42s and made their mark on them as well. Another German mark seen on Yugo's is bpr. I can't promise that the internals haven't been swapped as a repair, but I see a lot of parts and having German marks and Yugo marks isn't common but it's definitely not unheard of. Is your gun non-matching numbers? I'm guessing your receiver is victim to scrubbing and re-marking? If the numbers are matching, then your parts might be re-furbished (re-numbered) german parts left over from after the war? German marked post war tapered receiver ? It says you are from england, in europe fakes are much more common. Is it possible you bought a post-ww2 receiver with fake stampings added to them? The AA area could be faked too though. Don't the yugo's use rivets for certain things while germans used different non-permanent methods? I'm trying to think of where i read this, i'm thinking bolts or screws? Just look for WaA's that resemble my avatar . You'll have to teach me "the ways" some time, i need to master the '42 ! The shourd doesn't have the AA mounting at the front. Like I said before it makes little difference to me as to wether its a '42 or '53. I got it knowing and exspecting it to be a '53 and was amuzed to find many german markings. I personaly don't think they have been faked but who can really say. I'm no exspert. The markings on the belt pawls I would think would be very tricky to fake as well but again who knows. 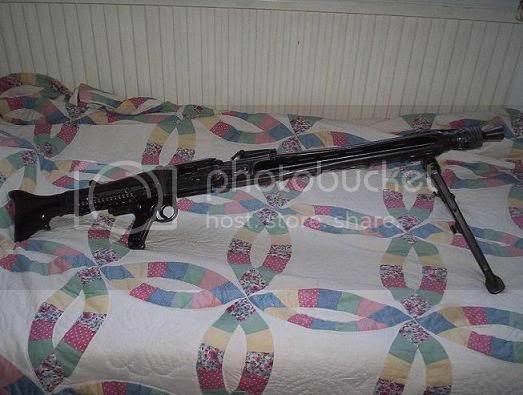 It has a short rear mount, and a flush-ish front sight mount which acording to other posts say its a M53. The yogo engraving doesn't aprea to be tampered with and if you were going to the trouble of stamping german markings on it I would think you would first try to erase the Yugo ones. I love the gun no matter what it is. It was only out of interest that I posted asking about it. I'm still baffled though... The yugo's made their later-style-taper post ww2 right? 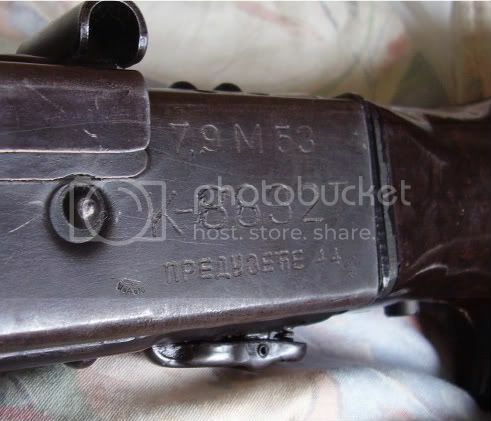 How the heck do you get wartime-ww2 stampings on a receiver that was not even in existence yet? Does your rear half look to be welded to the front barrel shroud? Maybe somebody restored it? Bil, rocco, anybody with any idea, what the heck is going on , did the yugo's use their differently tapered shroud on war-time production? I stripped it down this morning to have a good look for you and the reciever and shroud are one peice. Doesn't anyone else have a Yogo one with German markings on thereceiver? I'm the first owner of the gun since its been deactivated and I can't see the Yugo's stamping it nor anyone else before it was deactivated really. Stephenrc45 post a few more pics of your M53. 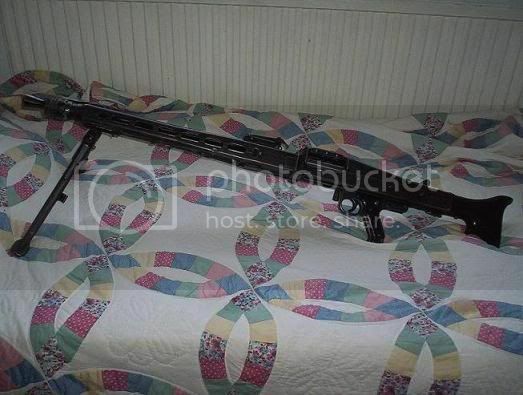 I think what you have is an M53 with some German parts on it, the bipod for instance is similar to my MG42. Is the WaA on the receiver the only German marking on it? 1. there would be little, if any, money in it. 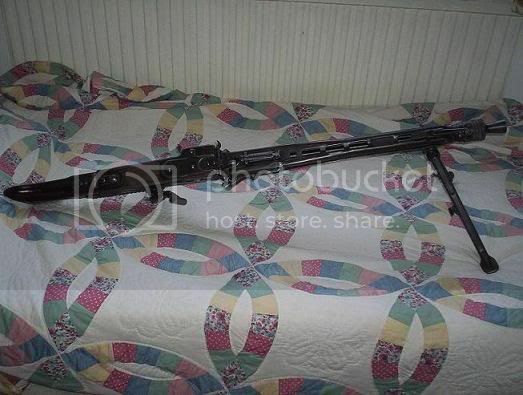 I have said before that the price difference between the M53 and the MG42 is about Â£500 and once you take into account all the work you would have to do to make it look real then there is little money left over. You may as well buy a real one and try to sell at a high price. 2. once you have your faked gun you have to sell it and I don't think the marked is that big for this type of thing, especially in the UK. 3. When they are deactivated the serial number, model type and country of origin are recorded on the deac certificate. So now you have to forge the deac cert as well. Lots of risk for bugger all money really. Now accessories, on the other hand, is a different story they are frequently over priced and have misleading descriptions etc. Yes the WaA is the only German marking I can see on the receiver. There are very few german markings on the gun. The only others are the WaA cof on the belt pawls and the dfb WaA on the biepod that I have seen. The rest are Sxxx-xxxx etc etc or BK or now and then a W in either a box or a triangle. Here are a few pics from either side. Thanks for to everyone for the info. This is proving quite interesting and fun.